HO CHI MINH CITY AND SINGAPORE, 3 July 2014 – Saigon Co.op Investment Development Joint Stock Company (“SCID”) and Mapletree Investments Pte Ltd (“Mapletree”) said today that more than half of the 41,000 sqm in net lettable area (“NLA”) of SC VivoCity – a shopping mall located in District 7 of Ho Chi Minh City, Vietnam, that they are jointly developing – has been taken up by 13 well-known retailers ahead of its scheduled opening in the first half of 2015. Vietsin Commercial Complex Development Joint Stock Company (“VCCD”), the joint venture company set up by SCID and Mapletree to develop SC VivoCity, signed memoranda of understanding (“MOUs”) with the retailers today to demonstrate their commitment. Collectively these retailers will take up about 21,270 sqm of space at SC VivoCity, or about 52% of the mall’s NLA. Among brands that will set up shop at the mall are prominent international names such as CGV, the largest multiplex cinema chain in South Korea. CGV will set up a cineplex that will include the Starium – a theatre that features a giant screen that is among the largest in the world, a powerful sound system and specially designed seats that aim to provide extra legroom. Big name Vietnamese and Singaporean retailers also feature strongly. Saigon Co.op, the parent company of SCID, is partnering NTUC FairPrice to set up a hypermarket called Co.opXtra that will anchor the mall, while an array of food & beverage offerings will be provided by Starbucks, MOF, BreadTalk, ThaiExpress, Pepper Lunch and Shabu Ya. Other tenants include health and beauty store Guardian, and Nu Cuoi Vui Game Center – which will set up a bowling and arcade amusement centre. Rounding up SC VivoCity’s list of pioneer tenants are: gymnasium operator California Fitness & Yoga Center (which will set up a dynamic lifestyle centre offering more than just a typical gymnasium experience); Korean indoor soft play kids club PLaytime; and Wall Street English, a leading global provider of courses that teach the English language. 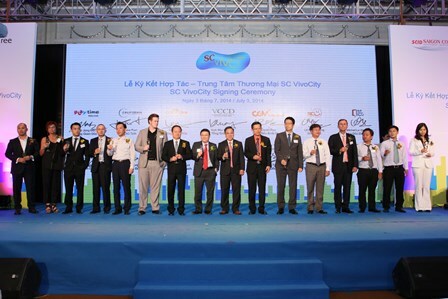 Confidence in SC VivoCity was also reflected by leading Vietnamese bank BIDV Bank. VCCD also held a signing ceremony today for funding facilities of up to VND840 billion (USD40 million) from BIDV Bank for the ongoing financing of SC VivoCity. This completes the financing required for constructing and developing the mall, which is on target to welcome shoppers in the first half of 2015. As at 30 June 2014, about 64% of construction work on SC VivoCity has been completed. When fully completed, the mall will have a gross floor area (“GFA”) of 62,000 sqm, with retail space spread over five storeys. SC VivoCity will possess the successful attributes of Singapore’s iconic and award-winning VivoCity shopping mall – the largest retail destination in Singapore developed and managed by Mapletree – with features such as a sky park incorporating a dry and wet children’s playground at its rooftop. SC VivoCity is the first phase in the development of Saigon South Place, a 4.4-ha integrated mixed-use project in Ho Chi Minh City. Besides SC VivoCity, Saigon South Place will comprise Grade-A office and serviced apartment buildings. Saigon South Place is located in District 7, Tan Phong Ward, along Nguyen Van Linh Boulevard. This is a district with a large presence of multinational corporations, a strong expatriate community and amenities such as international schools. Saigon Co.op Investment Development Joint Stock Company (SCID) is an affiliate of Saigon Co.op, Vietnam’s Top Retailer and among the top 500 retailers in Asia Pacific, an accolade it has held for many years. With chartered capital of VND1,000 million in which Saigon Co.op takes an 85% share, SCID has a primary mandate to develop the Co.opMart supermarket chain and other forms of commercial real estate such as mixed-use complexes, office towers, serviced apartments and department stores. As at June 2014, SCID has invested in and transferred 70 Co.op Mart supermarkets to Saigon Co.op. Ten large scale projects are being deployed, with 50% of these projects located in Ho Chi Minh City. By 2015, SCID will invest in and operate 100 supermarkets, hypermarkets and shopping malls in the Vietnam, as well as develop other forms of commercial real estate. It plans to expand its footprint across Asia in the near future. For more information, please visit www.scid-jsc.com. Mapletree is a leading Asia-focused real estate development, investment and capital management company headquartered in Singapore. Its strategic focus is to invest in markets and real estate sectors with good growth potential in Asia. By combining its key strengths as a developer, an investor and a capital manager, the Group has established a track record of award-winning projects in Singapore and delivered consistent and high returns from across various real estate classes in Asia. As at 31 March 2014, Mapletree owns and manages S$24.6 billion of office, logistics, industrial, residential and retail/lifestyle properties. Currently, it manages four Singapore-listed real estate investment trusts (REITs) and five private equity real estate funds, which together hold a diverse portfolio of assets in Singapore and throughout Asia. The Group has also established an extensive network of offices in Singapore, China, Hong Kong SAR, India, Japan, Malaysia, South Korea and Vietnam to support its regional expansion. Mapletree’s property portfolio includes award-winning projects in Singapore such as the VivoCity, Mapletree Business City, and Tata Communications Exchange as well as mixed-use developments in the region such as Future City and Nanhai Business City in China.